Jackson is an American city in the state of Wyoming. It is in Teton County. The current mayor of Jackson is Mark Barron. As of 2000, 8,647 people lived there. Many tourists go through Jackson when they visit the nearby Grand Teton National Park, Yellowstone National Park, and the National Elk Refuge. 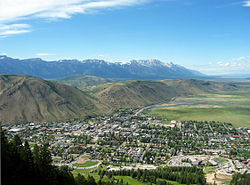 Wikimedia Commons has media related to Jackson, Wyoming. This page was last changed on 18 June 2018, at 02:03.